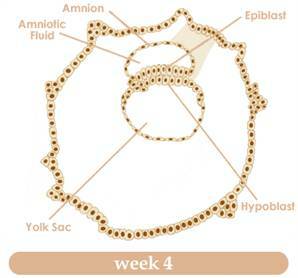 In week 4, you can know beyond a doubt whether or not you are pregnant. If you have waited until the fourth week to find out if you are pregnant you will have around only 38 weeks left. Today there are pregnancy tests that can tell you almost from the start. The best way to 100% confirm a pregnancy is to take a home test and then go to the doctor’s office and take their test. Now that you have 100% confirmed your pregnancy, it is time to realize what this means. Not only are you going to become parents but also you have to start taking care of yourself and the baby. If you are used to a fast paced lifestyle then you have to slow down. You will need better nutrition and more sleep. As you know the first trimester is the most important in the pregnancy. If you are over 36 years old they may consider you a high-risk pregnancy and there may be special things that you need to do especially if you are a first time mother. If you are just finding out that you are pregnant, congratulations! But now is the time to start taking care of yourself and the baby. The baby will start developing and growing at a quick speed for the first 5 months or so. You can help that development continue at a good pace by taking your vitamins and eating properly. This is the beginning of the pregnancy and how you take care of yourself will determine how the rest of the pregnancy will go. At this time, if you are confirming pregnancy, you will have a doctor confirm this at his office. At this time you will have a pelvic exam as well as a sonogram to determine how far a long you are. This will be the first of many sonograms and you will see month to month how the baby grows. Week by week and month by month you will see your baby develop on the outside but the organs and features of the baby will start developing as well. The intestines, lungs and bladder as well as the kidneys and nervous system will all start developing at a quick rate. As for your mental state, you will be ecstatic. You will be both excited as well as nervous. It is perfectly normal to experience anxiety at this stage. You can help reduce the anxiety and nervousness by taking some short naps and simply relaxing. As the pregnancy progresses, the body will create a hormone called HCG. At the beginning of pregnancy, you may experience some morning sickness as well as some dizziness, fainting and light-headedness. Sometimes women will experience abdominal cramps and some pains. If these persist, contact your doctor right away. At this stage, you will start to become extra sensitive to smells and odors that you may not have been aware of before. In the first trimester, it is not unusual for women to become fatigued and tired for no reason. But every woman is different and they may experience morning sickness up to the second trimester and some may only experience it for a few weeks. If you are experiencing something that doesn’t seem right, contact your doctor right away. It could be nothing but you don’t want to take any chances. You should expect in the fourth week of pregnancy to be excited, elated and nervous all rolled into one. As a new mom to be, it is important for you to start preparing yourself both mentally and physically. The most important thing during this time is that to you relax and avoid as much stress as you can. You have to remember what affects you mentally and physically will affect the baby as well. Now would be a good time to sit down with your significant other and discuss what your roles are going to be. You have to communicate the things that you are going to need for the next 9 months. It is important to start eating better and take the prenatal vitamins every day. You will also want to try to take it easy; even though pregnancy is an exciting time it can take its toll on you both mentally and physically. If you feel run down, take a break, if you are working crazy hours, take off a few hours. Running around and not taking care of yourself it will affect the baby. So now you have to act and think for two. At the end of the day, to relax, a warm bath would help take away all the stress. A warm cup of cocoa with whipped cream will relax you. Read a book with your feet up or simply watch your favorite TV show. Try taking a walk or joining a YMCA. Swimming is the best exercise for pregnant women and it is relaxing as well. Sometimes significant others tend to start gaining weight in sympathy for their pregnant partners. If you both try eating healthy together you and your significant other won’t gain too much weight during the pregnancy. It is common for women to gain anywhere from 25 to 35 pounds during the pregnancy. It is crucial to get a log of your weight. If you are gaining too much weight it won’t be good for the baby and if you don’t gain enough weight then you will experience problems as well. Staying healthy is the most important thing you can do. By eating right, you are helping the baby to grow and by reducing any and all stress will do a world of good for the baby. Ask your doctor if there is anything special that you can do a certain exercise. Ask for a list of foods and over the counter drugs that you cannot have. Having a healthy and happy baby all depends on you.